Do you have faith in your family tree? Community archives allow you to share your stories, pictures and memorabilia without parting with original writing, books or photographs because it's all done online. 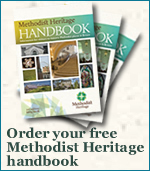 The Methodist Church has a network of three linked community archive websites. If you are researching your family's history and come across interesting Methodist ancestors, please tell us all about them. Or maybe you need help to find a branch of your family tree: post your enquiry and let's see if the Methodist community can help.